Barbara's husband Bob Spriggs died in 2016, following two stints at the notorious Oakden facility in SA. Source: Royal Commission live stream. The Royal Commission into Aged Care Quality and Safety held its first hearing on Monday, hearing emotional evidence from witnesses whose family members have been abused and neglected whilst in care, along with senior members from the country’s top older persons’ advocacy groups. 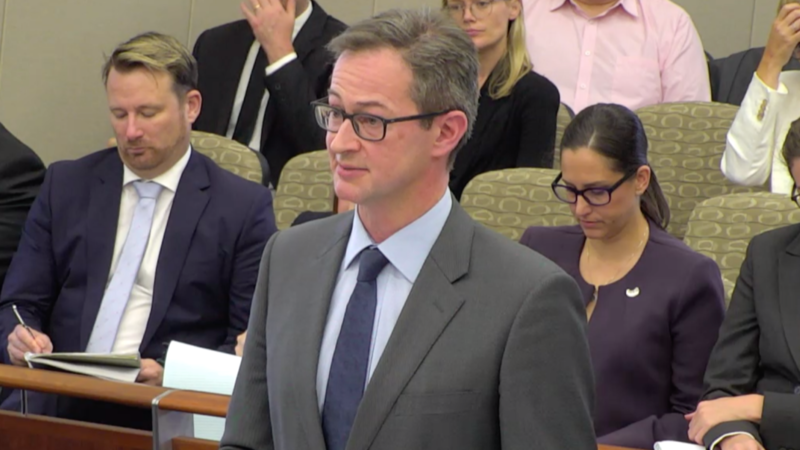 A total of four witnesses were scheduled to speak during day one of the hearing, addressing the need for an improved aged care system in Australia, following a compelling opening statement from Senior Counsel Assisting Peter Gray QC. The first witness to give evidence was Barbara Spriggs who delivered an emotional statement to the public hearing in Adelaide about the neglect, abuse and mistreatment that her late husband Robert ‘Bob’ Spriggs suffered at the hands of staff whilst he was a patient at the notorious – and now closed – Oakden facility in South Australia, before he passed away in July 2016. Barbara, who was accompanied by her son Clive – who also gave evidence on Monday – recalled her husband’s admission to the Royal Adelaide Hospital just one week after he was admitted to Oakden for the second time in February 2016. She revealed that Bob had to be transferred to hospital after he was given 10 times the required dose of his prescribed antipsychotic drug, as well as suffering “severe bruising on several parts of his body”, being dehydrated and suffering from pneumonia. Recalling the guilt she felt after discovering the extent of her husband’s suffering, she called for procedures to be put in place to help flag potential abuse at an early stage. Bob’s son Clive also called for an increased use of CCTV cameras in aged care facilities. Source: Royal commission live stream. During the heart-wrenching testimony, Barbara also recalled an occasion when she visited her husband at Oakden, when she said she found him alone in his “bare, locked room with just a sheet underneath him on the bed”, adding that there was no seat on his toilet and only paper towels in his bathroom. She also said that she had a “gut feeling” that Oakden was not a good place, but urged her two adult children “not to judge a book by its cover” when Bob was first admitted. The brave widow, who is now retired, then described feeling “helpless and numb and frightened” when her husband’s documented end of life care plan was ignored after Bob was transferred from Oakden to Royal Adelaide Hospital. Read more: ‘Older Australians deserve our respect’: Royal commission gets underway. 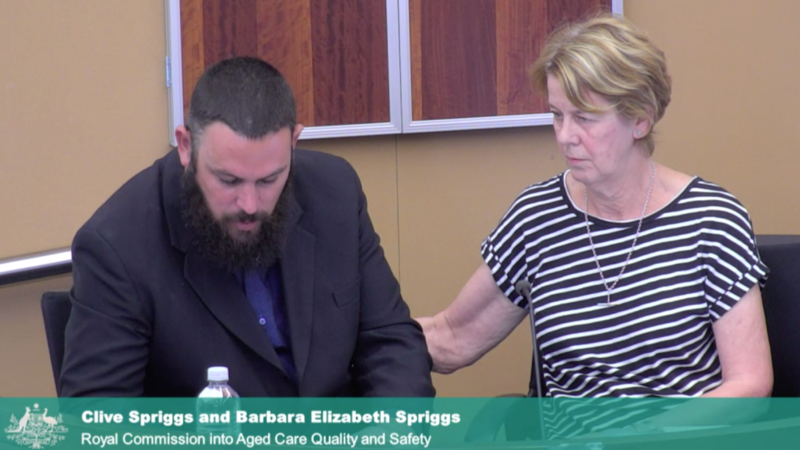 Barbara’s son Clive Spriggs also delivered an emotional statement, calling for change in the aged care system, with a focus on CCTV, accountability, staff training and staffing levels. The 39-year-old, who also has a sister named Kerry, said: “Looking back at what happened with dad, we do not know where the bruises he got came from. To this day we still don’t have an answer. I think CCTV cameras should be mandatory in all common areas, there should also be an option to have them in private areas. Senior Counsel Assisting Peter Gray QC opened the proceedings, detailing the scope of the hearing. Source: Royal Commission live stream. Opening proceedings at Adelaide’s Commonwealth Law Courts, Senior Counsel Assisting Peter Gray QC acknowledged that the ageing population presents “real challenges” but urged Australia to “become the nation we know we should be”. “Our older Australians are valuable members of the community,” he said. “We should have a society where all Australians are valued over their entire life spans. We, the Australian public, have a lot of work to do to improve our attitude towards older Australians. Following their moving and personal statements, Commissioner Richard Tracey thanked Mr and Mrs Spriggs for their evidence and expressed his gratitude to the pair. Chief Executive of the Council on the Ageing (COTA) Ian Yates and CEO of National Seniors Australia John McCallum also delivered evidence during the hearing. The Adelaide hearings will continue on Tuesday and Wednesday this week, and again from February 18 until February 22. Wha are your thoughts on this story? Do you have personal experience of substandard levels of care within the aged care sector?